What happens during a bar interview plays a big role in whether or not you land that bartending job. Although researching the position and writing a good resume are important, nailing the interview is crucial. 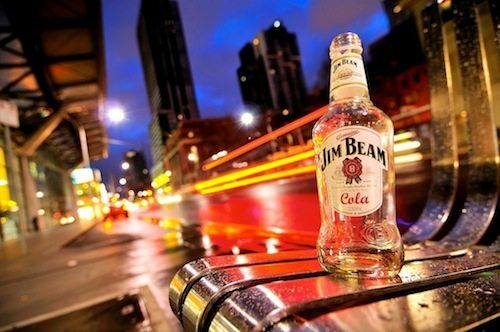 Working as a bartender can be a fantastic job, but it’s not for everyone. During a bar interview, you must remain relaxed, positive, show your personality and your desire to learn and always have great responses to the difficult questions your interviewer will ask. Below you’ll see bar interview questions which will guide you through what you should and shouldn’t say during your interview. During the interview, remember to avoid one-word replies. And, if at any time your interview is interrupted, which is bound to happen in a busy bar – smile and say hello to whoever comes over. You want to show the interviewer that you have a good attitude, are personable and don’t get easily distracted. The interviewer will be judging you on how you interact with the other staff and customers in the bar to determine how you might be with future customers. Remember that people want to work with someone they like. Don’t Forget! Bring a copy of your resume, cover letter, reference letters (if you have any) and bartending certificates you may have. Also bring a pen and paper so that you can take notes – you want to show the interviewer that you are interested in the position and are keen to get the job. You’ll also want to follow some of the tips on what to do before the interview. Bar Interview Questions: Why do you want to work here? This question is usually the opening question, and you want to nail it. Have a reason that is specific to the establishment. And not that it’s your favorite place on Saturday night and not that they are the only people hiring right now. Play to their ego a little and say you like the style of the bar and have recognized how well it is managed from coming in as a customer. Tell them that you think the service is great and that the bar staff seem to work well together. Mention that you would like to work in a professional environment where everyone works hard, but works together. Bar Interview Questions: Tell me about yourself. If you happen to lack experience and the interviewer mentions it, respond quickly expressing how you haven’t learned years of bad habits that would have to be undone. That you’re a clean slate in the bar world and you’re ambitious to learn the trade. Tell them you believe attitude and personality is more important and you have the attitude they are looking for. If you don’t have any experience at all, you can offer to work as a bar back to start out and work your way up. Or, if you don’t have any real experience but are confident of your bartending skills, you can offer to work a shift or two for free to prove that you have what it takes to work in a fast-paced environment like the bar industry. Bar Interview Questions: What are your strength and weaknesses? The trick question. Go ahead and brag about what you’re good at. “I’m a great conversationalist and can find something in common with the other person quickly” or “I am very punctual, and that spills over into all my work, including returning to customers and checking up on them regularly” or “I have a very strong work ethic and take pride in what I do”. Bar Interview Questions: Tell me about a difficult customer you had to handle and what you did to resolve the situation? Have a story ready from your first job. For example, your first burger flipping job during high school when you were trying to save up for college. Let’s say that you had a customer that came in and always wanted to special order a burger – and it was always during peak times when you were busy in the kitchen which slowed everything down. So, you talked to the customer and made him a deal. You told him that as soon as you saw him come in, you would start his special order burger with the next set of meat you put on the grill. He would simply order the same way and then step to the side and wait for his burger. This way, I was able to start his special order when I was ready and it didn’t take a half hour for him to explain his order and for the cashier to find a way to punch it in. Whatever it is, make sure that you have a story ready before you get to the interview. Ready for Round 2 of our Bar Interview Question & Answer Series? 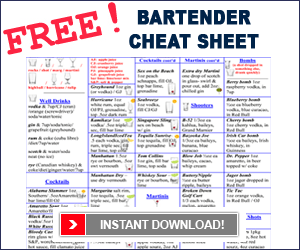 If you have trouble remembering cocktail recipes, make sure you download our Free Bartender Cheat Sheet and study!